Increased solar activity causing disturbances in the Earth's magnetic field may cause whales to run aground in the North Sea, say researchers. Analysis of whales stranded between 1712 and 2003 shows that more are stranded when solar activity is high. Writing in the Journal of Sea Research, scientists propose that whales use the Earth's magnetic field to assist navigation like homing pigeons do. As the Sun disrupts the magnetic field whales can become confused, they say. The Sun goes through a cycle with an average length of about 11 years, though individual cycle lengths have ranged from eight to 17 years. Some evidence exists to suggest that shorter cycles produce a higher flux of radiation from the Sun. Dr Klaus Vanselow and colleagues from the University of Kiel have analysed the lengths of solar cycles and have found that 87 of the 97 reported sperm whale strandings over the past 300 years in the North Sea region occurred when the length of the Sun's activity cycle was below average. They argue that whales may be like pigeons and dolphins in having a magnetic sense based on small crystals of magnetite found in certain cells. Pigeons use such cells to sense the Earth's magnetic field to help in their navigation. Pigeon enthusiasts are well aware that the birds can go astray during times of high solar activity, when disturbances in the magnetic field confuse them. 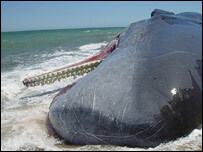 "It may be the same for whales," Dr Vanselow told the BBC News website. "Sperm whales migrate long distances with very little visual clues as to where they are going. It would be unsurprising if they too had a magnetic sense. "We believe that our research showing that more whales are beached during times when the Sun disrupts the Earth's magnetic field makes it a strong possibility that they do." The numbers of cetacean - whale, dolphin and porpoise - strandings around the UK have doubled over the last 10 years. Marine mammal experts say an increase in fishing activity, which leads to more "by-catch", is a major cause of the problem. Campaigners also claim increased noise in the oceans, coming from ships' engines and sonar, is a significant factor in whales losing their way.